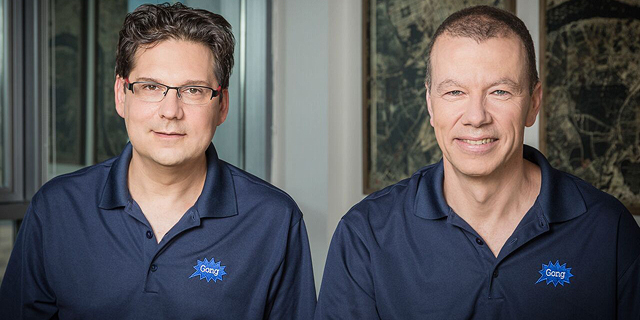 Israel-based conversation analytics startup Gong.io Ltd. has raised $40 million in a series B funding round, bringing the company’s total funding raised to $68 million, Gong.io announced Thursday. The round was led by Boston-headquartered Venture capital firm Battery Ventures LP, with participation from existing investors including California-based Norwest Venture Partners, Check Point co-founder Shlomo Kramer, and Cisco Investments. Based in Herzliya, a town in the Tel Aviv area, Gong.io’s technology provides sales representatives with real-time insights into their interactions with customers by analyzing recorded phone calls to track keywords and topics within a conversation. In December, Gong.io won Calcalist’s and Microsoft’s second annual artificial intelligence and big data startup competition. The award included a visit to Microsoft's Seattle headquarters and an invitation to take part in Calcalist’s 2019 Berlin conference to be held later this month. Gong.io serves around 150 clients including LinkedIn and Pinterest, according to company statements.